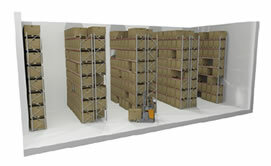 Capable of storing any pallet type with 100% accessibility to all pallets stored, no restrictions in layout and adaptable to future requirements, Dexion P90 Standard Wide Aisle pallet racking is the most popular form of racking system, used by companies the world over for their storage needs. Allowing complete access to all pallets using a standard forklift truck and with no restrictions in layout for pallets stored, Standard Wide Aisle pallet racking is the most widespread form of pallet racking. Assembled as single or double depth racks, the racking is highly flexible, making it suitable for the most modern warehouses and especially popular with industry and logistics companies. Dexion P90 racking comes in a range of different heights, widths and depths allowing it to adapt to any space specifications, and can be used to store all types of pallets and storage items – Euro, Chep, disposable or captive pallets, mesh boxes or bins. Exceptionally stable, the Dexion P90 racking system has rack construction heights of up to 30 metres and can support loads of up to 30 tonnes. All P90 racking systems are designed to comply with the stringent requirements of EN, FEM, SEMA, DIN and INSTA standards. The entire system is permanently corrosion resistant, ensuring an installation with a long service life. A huge range of accessories, optional safety features, different beams, angle supports, shelves and signing and marking systems allow for the racking to be customised to suit your specific storage needs. Dexion P90 racking is highly adaptable; a modular design provides a system that can evolve to change with your future storage requirements. Designed to allow you the flexibility in layout, pallets stored, access and future modifications that you need from your storage system, Dexion P90 Standard Wide Aisle pallet racking will give a long-lasting storage solution that is perfectly tailored to your needs. If you would like to request more information on P90 Standard Wide Aisle Pallet Racking or speak to one of our experienced sales team, call us now on 08082399422.